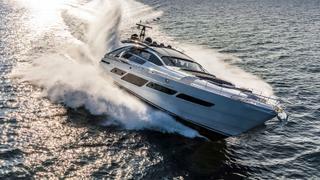 The first hull in the new Pershing 9X series has been launched by Ferretti Group and named Najati. Completed just in time to make her debut at this week’s Cannes Yachting Festival, Najati is based on the same 28.14 metre hull as the outgoing Pershing 92, which spawned more than a dozen hulls. Accommodation is for eight guests split between four cabins including a full-beam amidships master cabin complete with walk-in wardrobe, along with two twin cabins and a VIP in the bow. Meanwhile, the crew quarters allows for a staff of up to three people. Key changes from the Pershing 92 include extensive use of carbonfibre and an enlarged cockpit with a huge sunpad, however, the distinctive Pershing superstructure wings have been retained. Ferretti Group describes the Pershing 9X as a fighter jet and Najati certainly has the power to back up that bold metaphor. 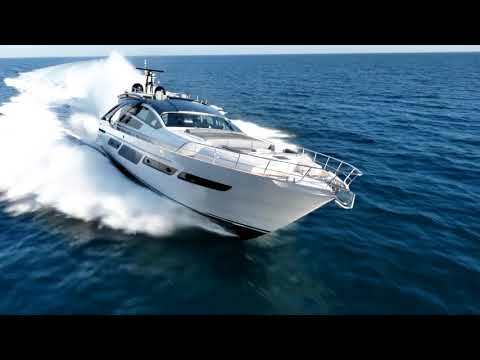 Twin MTU 16V2000 M96L engines propel this fast planing yacht to a sporty top speed of 42 knots, while the cruising speed of 38 knots gives a range of 380 nautical miles, drawing on a total fuel capacity of 9,000 litres. The interior of Najati is decidedly modern with premium furnishings from the likes of Poltrona Frau and Antonio Luppi. The Pershing 9X range is already proving to be a big success for Ferretti Group with the first three hulls already sold and negotiations on the fourth hull at an advanced stage. A fleet of 25 new yachts from the Ferretti Group was assembled for this year’s Cannes show, including the new Custom Line Navetta 33, Ferretti 780, Ferretti 920, Riva 100 Corsaro and Rivale 56.